We were very pleased to have so many join us throughout the day on Saturday for our day of prayer for the Church. Exposition of the Blessed Sacrament continues every Saturday throughout Lent, from after the 10am Mass until Benediction at 6pm. On Thursday 28th February, there will be a special Sung Mass for the Pope at 6pm. This will be followed by Exposition until 7pm, when the Holy Father will resign his office. Please join us to pray for him, the Church, and for the conclave that will elect his successor. Below are the prayers for the Holy Father that were used last Saturday. Let us pray for the Holy Church of God, that our God and Lord may give her peace, maintain her in union, and preserve her over the earth, making principalities and powers subject to her; and grant us to lead a quiet and peaceful life to the glory of God the almighty Father. Almighty and everlasting God, who hast revealed thy glory to all the nations in Christ, preserve the works of thy mercy, that thy Church, being spread over the whole world, may persevere with a constant faith in the confession of thy name. Through the same Christ our Lord. Amen. Lord Jesus, shelter our Holy Father the Pope under the protection of your Sacred Heart. Be his light, his strength and his consolation. Amen. St Paul, pray for us. St Aloysius, pray for us. St Philip Neri, pray for us. That you would keep the Pope and all the clergy faithful, we beseech you, hear us. O God the source of all holy desires, right counsels, and just works, grant to your servants that peace which the world cannot give; that our hearts may be wholly devoted to your service, and that, freed from the fear of our enemies, we may pass our days in quietness under your protection. 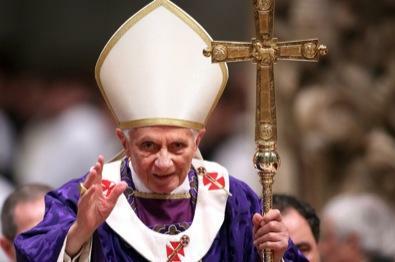 Let us pray for our Holy Father, Pope Benedict. and deliver him from all harm.